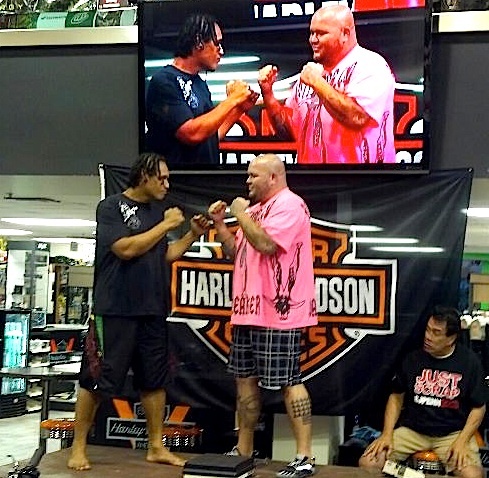 Hilo’s Wesley “Cabbage” Correira (right) at the pre-fight weigh-in with Maui’s Paea Paongo. Photo by Kre8ive Khaos. 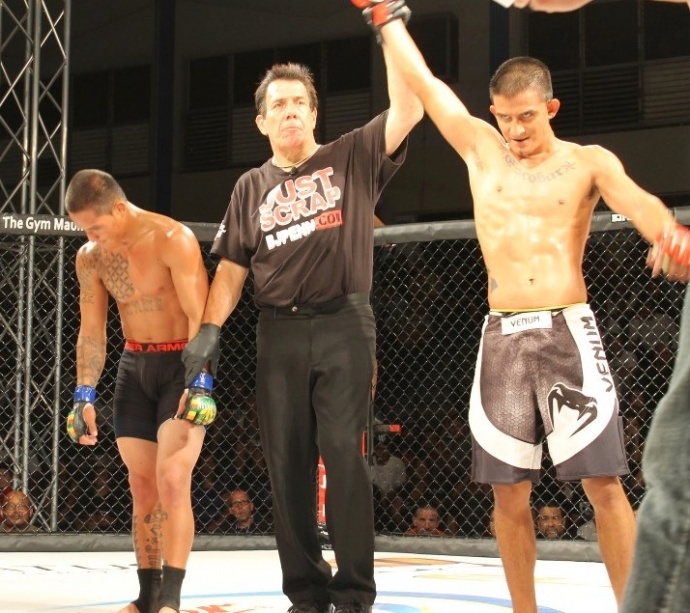 Hilo’s Wesley “Cabbage” Correira earned his first mixed martial arts win in five years Friday, March 15, submitting Maui’s Paea Paongo in the first round of the Just Scrap IV main event. The 6-foot-3, 265-pound Correira had Paongo in full mount early before executing a kimoura lock. Both fighters were bleeding at the end of the fight before a jam-packed War Memorial Center. Correira is best known in MMA circles for the amount of punishment he took at the hands of Tim Sylvia in UFC 39, 11 years ago. He went on to fight three more times in the Octagon, winning two fights before succumbing to the punches of Andrei Arlovski. Over that three-year span (2001-2003), Correira won 13 times in 15 fights. Referee Mike Donahoo raises the hand of Maui’s Daisel Escobar, winner by decision over Hilo’s Maui Acantilado. Photo by Kre8ive Khaos. 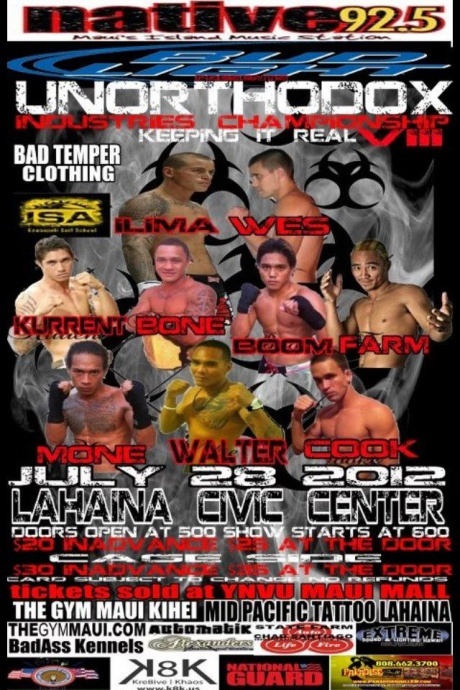 Friday’s win, only his third by submission compared to 15 KO’s, improved the Big Island fighter’s record to 20-15. Correira, who retired in 2008, loss his first comeback fight, Jan. 19, to Deutsch Pu’u by technical knockout in the first round. He retired in 2008 with a career record of 19-14, losing seven of his last nine fights dating back to 2006. In two other semi-main events, Gabriel Vian of Las Vegas defeated Maui’s Adam Akau by TKO in the first round of their 205-pound fight, and former Maui resident now living in Honolulu, Ilima Maiava beat Ansalmo Guitirrez of Las Vegas by decision at 200 pounds. 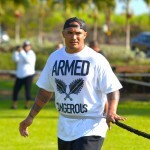 Ilima Maiava is the older brother of NFL linebacker Kaluka Maiava, who signed a free-agent contract with the Oakland Raiders on Wednesday, March 13.